Cancellation of groups 7 days prior arrival 30% of reservation will be charged on clients credit card. Cancellation of groups from 8 until 14 days prior arrival 10 % or reservation will be charged on clients credit card. Cancellation of groups from 14 until 21days prior arrival 1% or reservation will be charged on clients credit card. Built in 1990, with extensions added in 2001, 2002 and 2006 , 'Castro Hotel' lies in the middle of Amoudara town only 300m away from the famous sandy beach, just 5 km away from the centre of Heraklion. The hotel Castro has 78 rooms and 4 apartments all recently renovated. There are rooms with sea,mountain and pool view.All rooms have their own bathroom, private balcony, HD TV, wi-fi ,telephone device, hairdryer, refrigerator and air-condition. 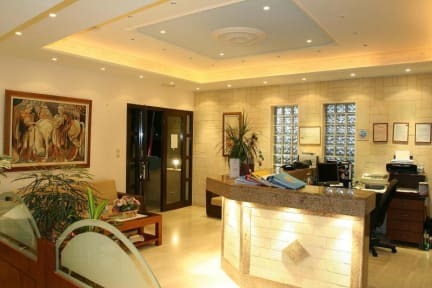 The Hotel offers the conditions to fulfill all the needs of a memorable holiday. Maxim is the name of the restaurant inside the hotel where you can taste the famous and healthy Cretan cuisine. It also has a bar and serves Greek and international dishes as well. By the swimming-pool you will find our pool-bar, where you can enjoy, apart from a relaxing swim, many refreshments and various cocktails. Our customers can also enjoy our beautiful sunny swimming-pool and sunbath in our garden. The hotel also has reception with 24 hours check-in, a dining room, and a TV Wide screen projector corner. 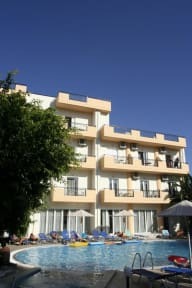 The Hotel offers various services and facilities, such as a reception, multi-lingual staff, a dining room, TV room, an open-air parking area, children pool and a spacious garden.